Beacon Products’ Orbeon compact commercial grade LED parking garage and canopy luminaire measures 4.5 inches by 5.3 inches by 11.25 inches, the Orbeon utilizes high-powered LEDs, precise efficient optical control and features application versatility through integrated intelligent control options. The luminaire is equipped with an electro-galvanized mounting bracket for quick and easy mounting to an overhead junction box. An optional drop lens molded from impact-resistant acrylic is ideal for applications such as drive-thru lanes or commercial canopies, which are likelier to suffer damage from vehicles. Additionally, the luminaire may be outfitted with a bird guard to deter nesting atop the luminaire. 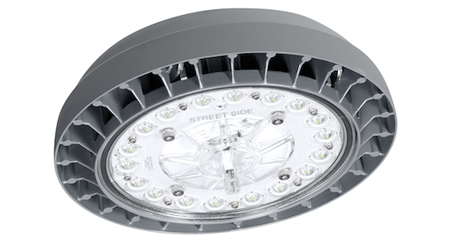 The Orbeon is designed to replace up to 175 watt HID lamps, using only 60 watts of power. Projected to shine for more than 100,000 hours, the Orbeon significantly reduces required maintenance. The luminaire is certified to UL 1598 and 8750 for use in wet locations and features a five-year limited warranty. The Orbeon with optional Beaconnect Lighting Control technology can form a mesh network for ease of user interaction, yet the fixture can function independently for maximum reliability. Due to the minimal hardware and commissioning investment and the highly integrated design, the Beaconnect Lighting Control system gives small to medium-sized operations the wireless access they’ve always wanted at a fraction of the price of other controls systems.